Experience verbal harassment and inappropriate behavior more than males. The survey’s results are nuanced, as they always are, so consider this is the highlights reel. Dig deep into this long article to explore what we learned. 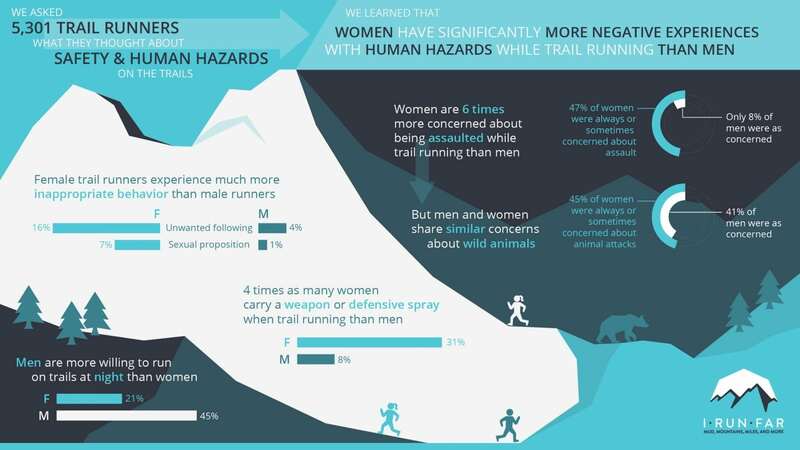 The survey’s results are grim for female trail runners when it comes to perceived danger of and actual exposure to human hazards. And it’s not just some women in a few cases; the statistics tell us that it’s a lot of women in many cases. I hope we can move forward together with open minds and hearts. We trail runners are a close-knit community and all of us should dislike the fact that women–or anyone–find our trails unsafe because of humans. In historic seafaring literature, the ship-following albatross was a symbol of both luck and a lack of it. I propose that the albatross becomes our positive metaphor. The knowledge we now have can be the foundation of a profound transformation for women on the trails. 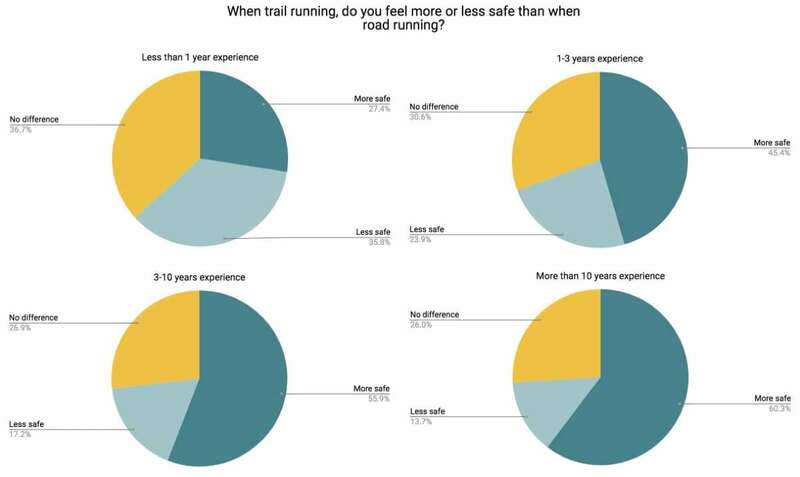 Back in November, iRunFar’s Trail Sisters–Liza Howard, Pam Smith, and Gina Lucrezi–asked you to help us better understand fears and safety issues in trail running via a survey. In the two weeks that the survey was open, we got a whopping 5,301 responses. Our heartfelt thanks to all those that took the time to answer our questions! 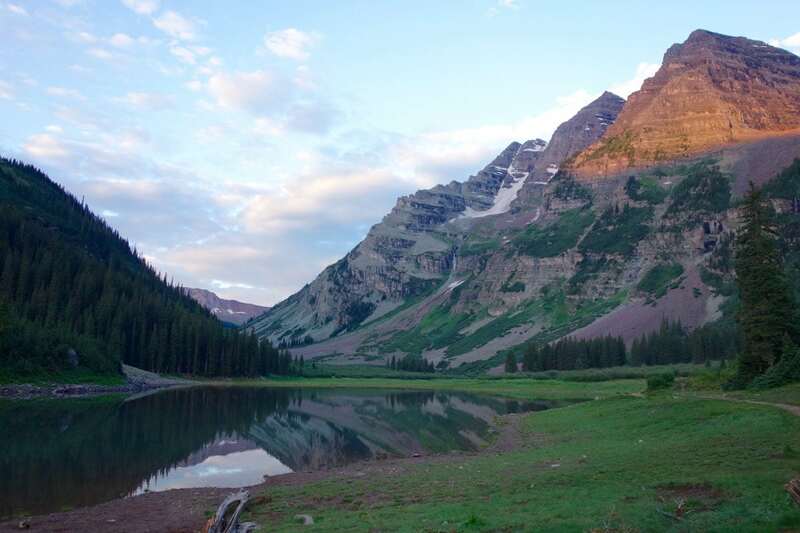 We were initially drawn to this topic after a female trail runner was attacked in an urban park near Liza’s home in San Antonio, Texas last September (news report). In fact, three other female trail runners had been attacked in nearby Austin between August and September 2017 (news report after third attack). But it was comments on social media faulting the victims of these attacks for putting themselves in unsafe situations by trail running that finally galvanized us to start writing. Then Liza came across a 2016 survey and article in Runner’s World that explored women’s experiences being harassed while road running. The survey data made us question whether female trail runners have significantly different experiences, concerns, and perceptions about safety and human hazards than male trail runners do. None of us had ever really considered how this facet of trail running might be markedly different for female and male runners. Do women anticipate some level of harassment or unwanted sexual attention as trail runners? And men don’t? It was an ‘aha moment’ for us all. We decided we needed to actually survey the trail running community to find out. With Runner’s World’s permission, we modified some of their survey questions to better suit trail runners. 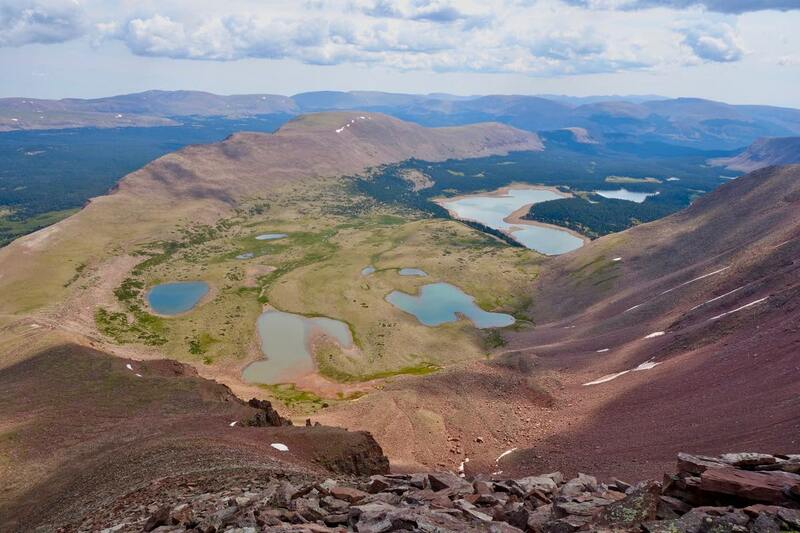 View iRunFar’s survey as well as the raw-form data collected in it. In this article, we present the results and, when possible, compare and contrast your responses with the responses from our road running counterparts. A note on mechanics, the results are presented in written and graphic form, but for brevity, a majority of the graphics are collapsed. Click on the links throughout the article to open them. In the near future, we’ll follow this up with an article and conversation that explores what our community can do with what we’ve now learned. 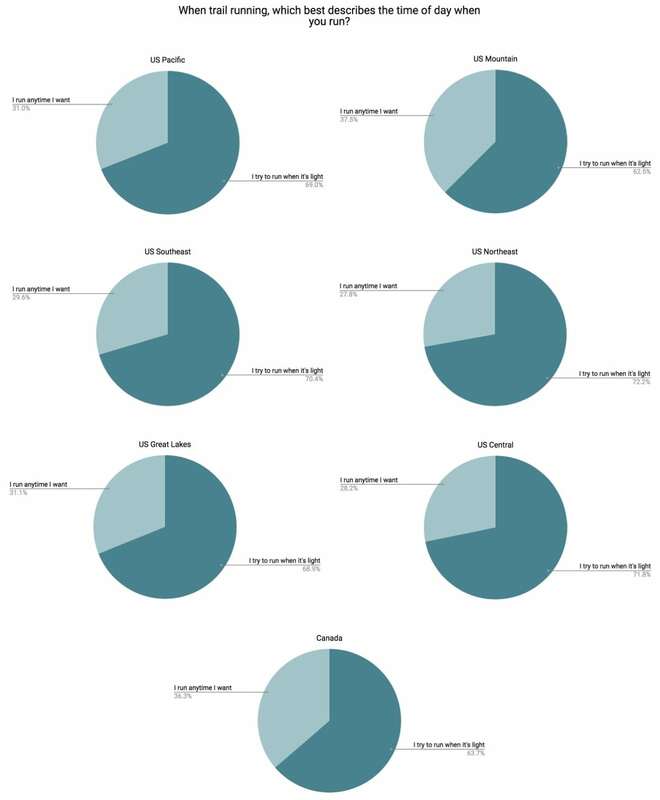 Let’s break down the demographics of those who participated in the survey. Of our 5,301 respondents, 54.5% were male and 45% were female. Because women are a smaller segment of the trail running community and iRunFar readership, we were thrilled to have this level of participation by females. 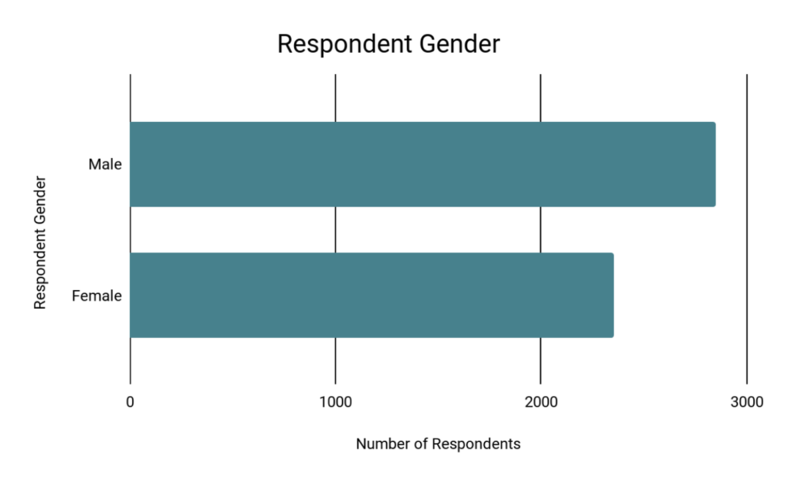 See respondent gender data in chart and numeric forms. The gender breakdown in the Runner’s World survey was almost the exact opposite of ours with 45.7% male and 54.3% female respondents. They had fewer total respondents than we did at 4,670. It is important to note that the iRunFar survey also had a broader list of gender choices than the Runner’s World survey. Roughly 0.3% of participants answered as a “non-binary/third gender” or “self described” gender, which were too small of sample sizes for analysis. So, this results article focuses on male and female responses. The majority of our responses came from runners between the ages of 30 and 49. This distribution was similar across genders. 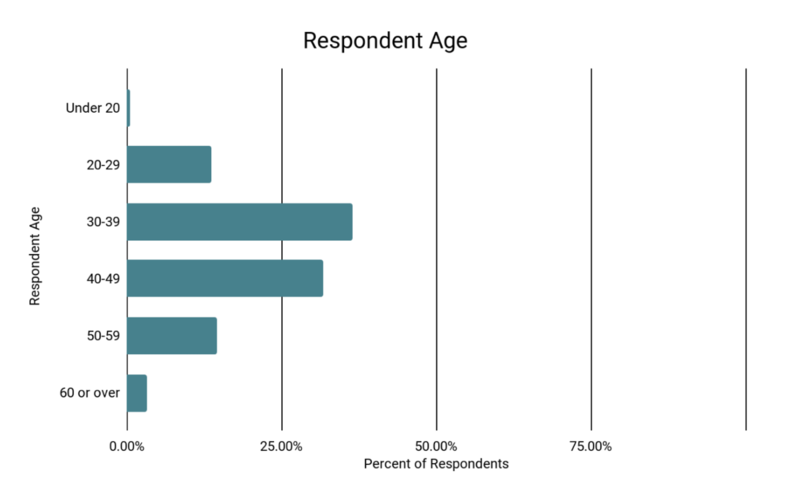 See respondent age data in chart and numeric forms. The under 20 age group, representing just 0.6% of the respondent population, is also too small a sample size, so it isn’t included in the results analysis. Most of the responses came from the United States, but runners from Canada, Europe, and other parts of the world also weighed in. Almost half of the U.S. respondents hailed from the Pacific and Mountain regions of the country. See respondent geography data in chart and numeric forms. Almost half of the trail runners who responded had between 3 and 10 years of trail running experience. More than a quarter had been running trails for 1 to 3 years, and about a fifth were veteran trail runners with more than 10 years under their belts (and belt buckles). We received relatively few responses from newbie runners with less than a year on the trails. See respondent trail running experience data in chart and numeric forms. Interestingly, almost half of the runners who took the survey live in rural/remote areas. Most of the rest of the respondents call suburbia home. Unsurprisingly, fewer trail runners choose to live in cities. 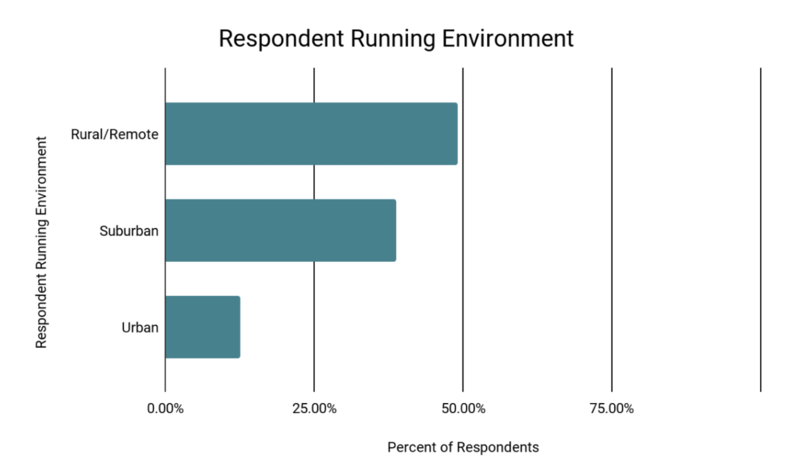 See respondent running environment data in chart and numeric forms. To identify experiences of inappropriate behavior and verbal harassment on the trail. This section explores answers to the questions asked about concerns with human hazards. Question 1: As you prepare to go on a trail run, how often are you concerned you could be assaulted or attacked by another person. View the original survey and read this question in full. 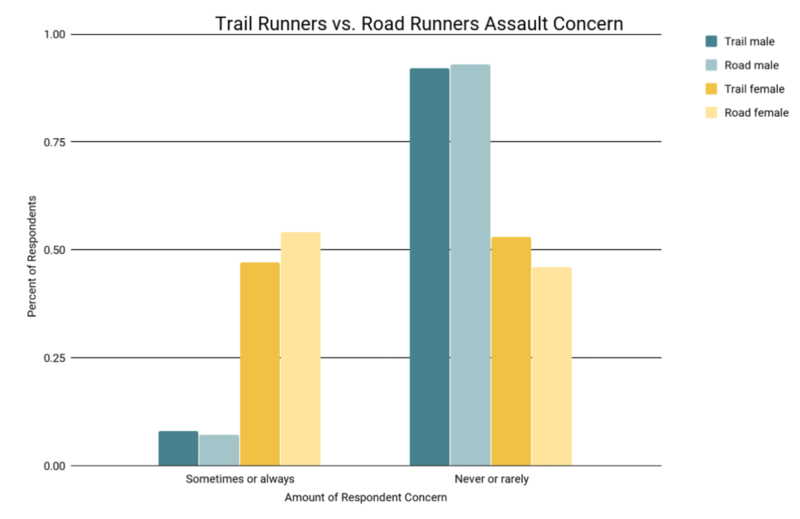 The vast majority of respondents said they are “rarely” or “never” concerned about being attacked by another person while trail running. See this data in chart form. There is a striking gender difference between respondents. While more than half of men are “never” concerned about being attacked by another person while trail running, only 14% of female respondents felt the same. 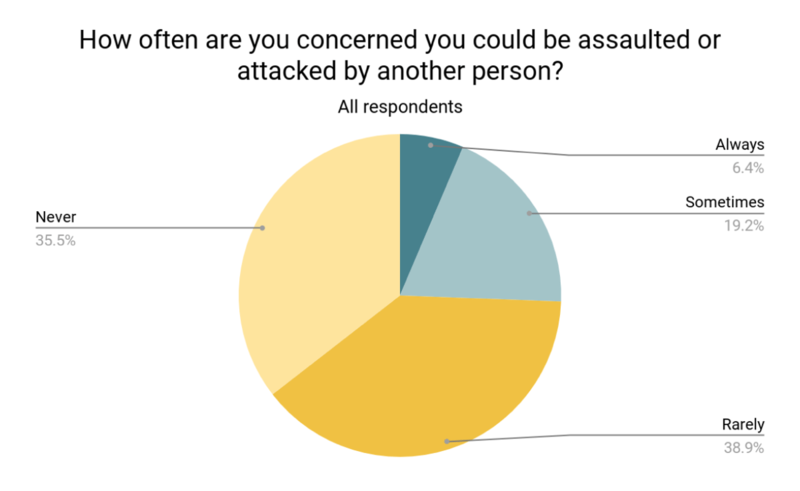 And only 8% of men are “always” or “sometimes” concerned about being attacked by a human, compared with close to half the women who responded. This gender difference on the trails mirrors runners’ experiences on the roads. 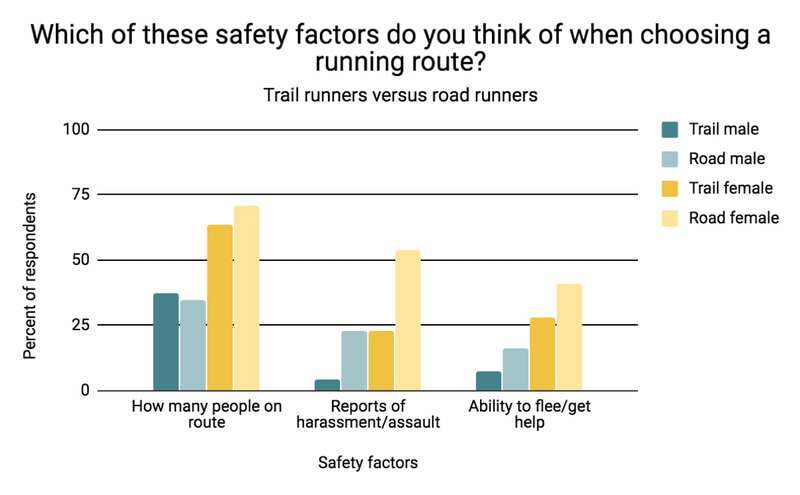 The vast majority of both trail and road running men “rarely” or “never” have concerns about being assaulted while running, whereas only around half of trail and road running women feel the same lack of concern. Also, note that trail and road-running males share almost the same amount of concern, while road running females have more concern than their trail counterparts. See this data in chart form. Good news! One factor that affected the amount of concern both men and women had was the number of years they’d been running. The longer you run, the less concerned you are that you’ll be attacked by someone. This is a particular boon for female trail runners whose daily runs are colored by these concerns more than men’s are. Of course, it’s important to recognize that non-event feedback, the ‘nothing happened to me last time’ evaluation, can be a hazard in and of itself. The men who responded had slightly more trail running experience than the women did. 74% of the male cohort had three or more years of trail running while only 62% of the females had that many years on the trail. This difference doesn’t explain the huge disparity in women’s and men’s safety perceptions, but it clearly has an impact. The higher incidence of inappropriate behavior and verbal harassment female trail runners face may diminish the effect experience has on their concerns. See this data in chart form. Unsurprisingly, where you run also affects how concerned you are about being attacked by another person. More trail runners feel safe from human hazards while running in rural and remote areas than on urban trails. See this data in chart form. We also see variations in concern levels based on where in the world a trail runner lives. Europeans are the least concerned about being attacked by another person. 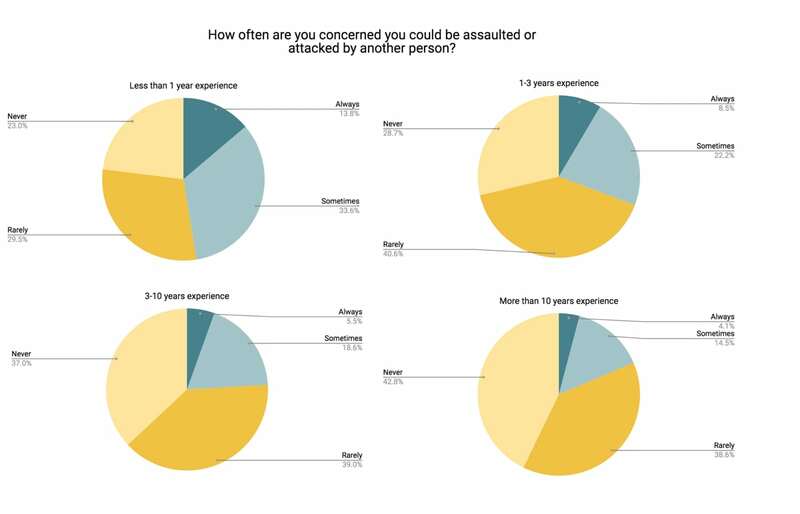 Most said they are “never” or “rarely” concerned about assault. See this data in chart form. European respondents have a much higher rate of rural running than North Americans and runners in the rest of world. They also have more experience trail running than these two groups. These factors likely impact their perceptions of human danger. Question 3: When trail running, do you feel more or less safe that when road running? View the original survey and read this survey question in full. 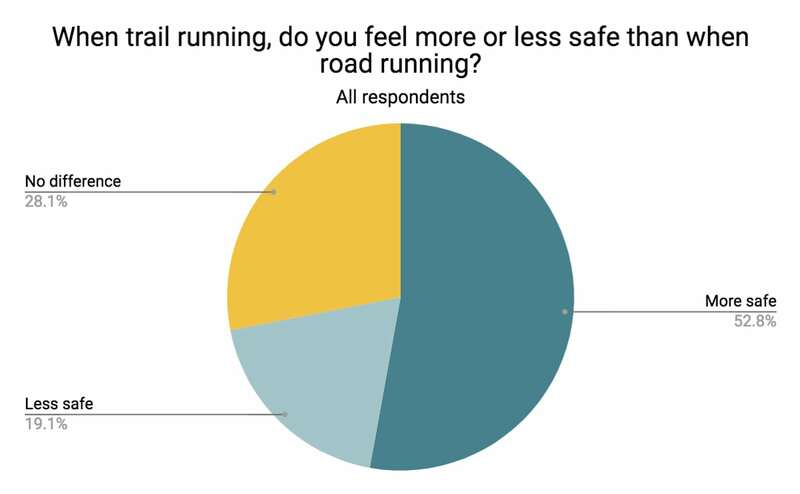 The vast majority of respondents said they feel “no difference” or “more safe” on trails compared to roads. See this data in chart form. Take a look at the statistically significant difference between how men and women answered this question. About double the number of women as men feel trail running is less safe than road running. 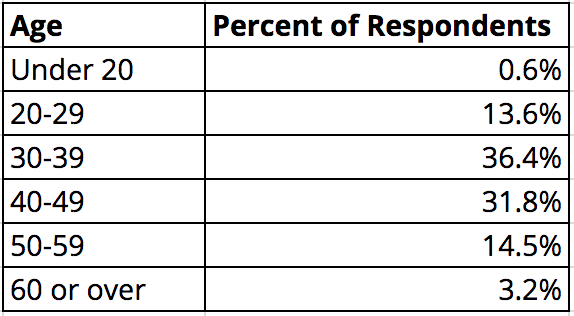 Of course, what kind of environment respondents trail run in affected how they answered this question. Those running in urban environments indicate they felt trail running was less safe than road running 27% of the time, and those running in rural/remote environments said the same only 15% of the time. See this data in chart form. 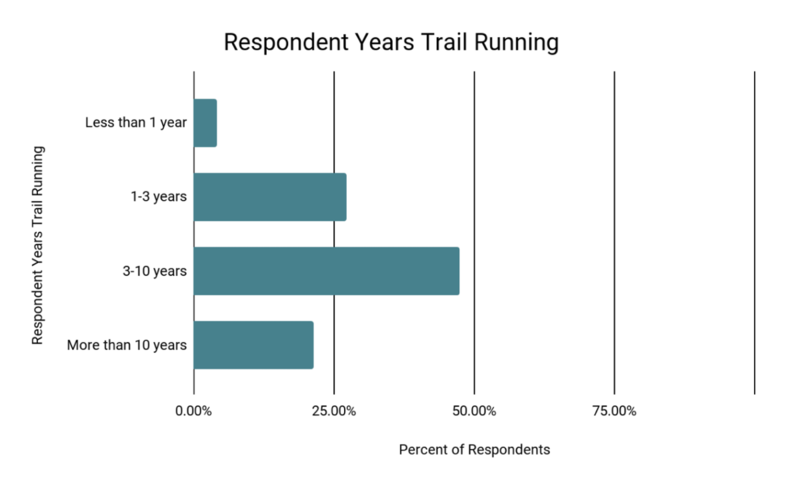 Respondents’ years of trail running experience impact answers. The longer you are a trail runner, the more safe you think trail running is compared to road running–by a whopping amount. See this data in chart form. Question 10: As you prepare to go on a trail run, how often are you concerned you could be attacked by a wild animal? 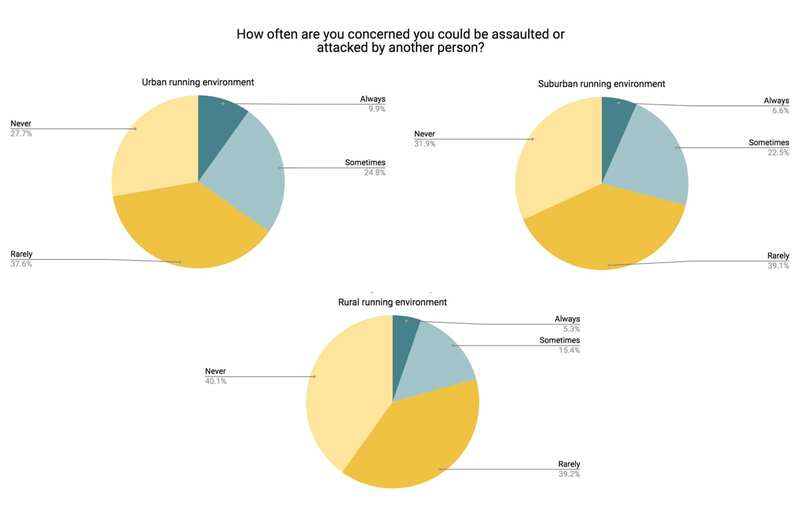 Although this survey focused on exploring concepts of safety from humans while trail running, we asked trail runners about their concerns about being attacked by a wild animal so we could examine how respondents gauge the risk of an environmental hazard (attack by a wild animal) versus a human hazard (assault or attack by a person), which we asked respondents about in Question 1. What follows are comparisons between answers to Questions 1 and 10. 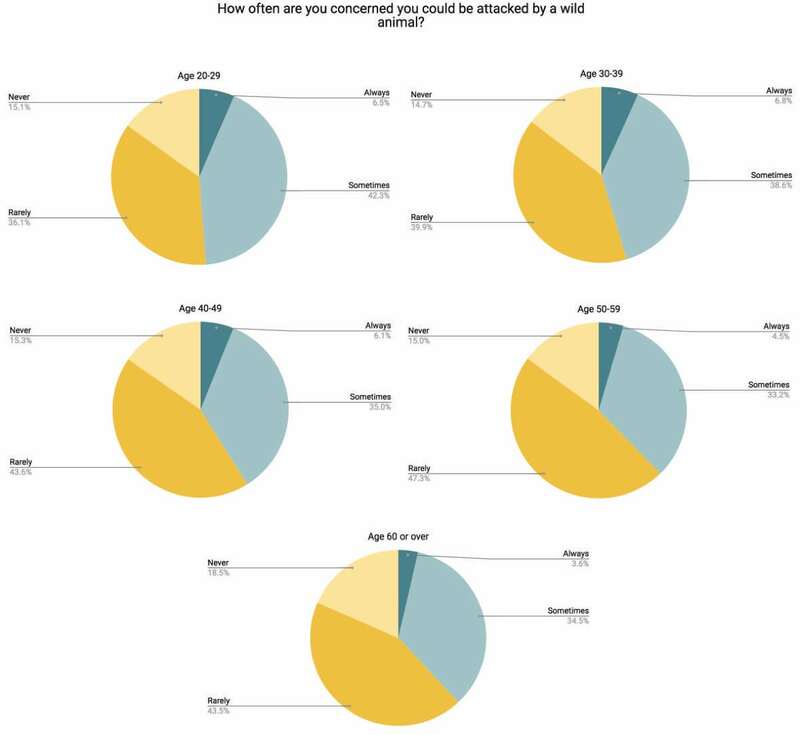 The total number of respondents who were “always” concerned about human attacks was almost the same as the number who were “always” concerned about being attacked by a wild animal. But far fewer runners discounted the possibility of wild-animal attacks. Only 15.2% said they were “never” concerned about being attacked by a wild animal compared to 35.5% who “never” worried about being attacked by another person. See this data in chart form. Women and men answered similarly regarding their concern about being attacked by a wild animal. 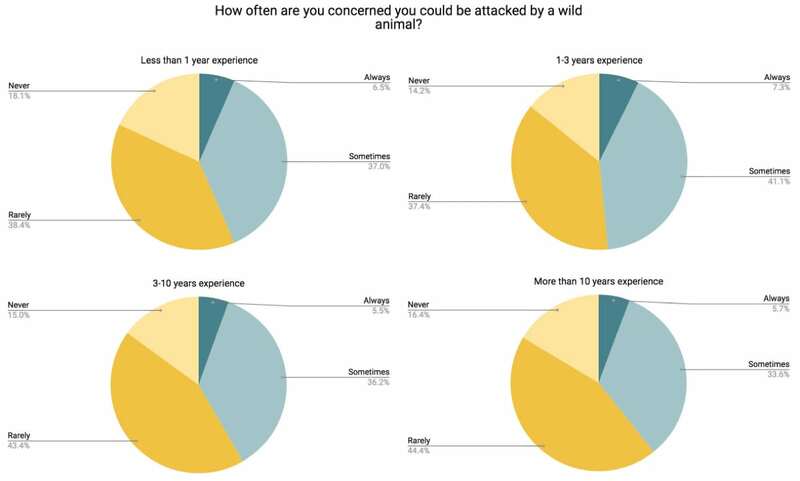 But note the higher proportion of females who “always” feel concerned about an attack by a wild animal compared to men. What we learn through this comparison is that while men and women share similar concerns about wild-animal attacks, they think very differently about the possibility of human attacks. Men are much less concerned about being attacked by another person. Look back at the data from Question 1 in chart form. Predictably, respondents from geographic regions with more wild landscapes and predatory mammals were more concerned with animal attacks. The U.S. and Canadian groups had a much higher concern about animal attacks than their European counterparts and runners living in other parts of the world. Bears and mountain lions, oh my! See this data in chart form. We are fascinated by the variations in how this question was answered by trail runners of varying ages. The age 20 to 29 bracket expressed the most concern among all the age groups, reporting in at almost half the group being “sometimes” or “always” concerned. And from age 30 on up, levels of concern decrease in each increasing age group. We guess, the older you get, the less you think something that can eat you, will eat you? See this data in chart form. Here’s a fun demographics-trend variation. Trail runners with 1 to 3 years of trail running experience expressed the most concern about a wild-animal attack, more than trail newbies with less than 1 year of experience. A little knowledge about what’s ‘out there’ is enough to cause concern, perhaps? More predictably, perhaps, runners with 10 or more years of experience expressed the least concern. See this data in chart form. In this section, we explore answers to the 4 questions asked in the survey regarding trail runners’ behavior with regards to their safety from humans. Question 4: When trail running, which best describes the time of day when you run? Give them headlamps, and they will run. A third of trail runners don’t care if it’s light out or not; they trail run anyway. See this data in chart form. Once again, there is a marked difference between women and men. 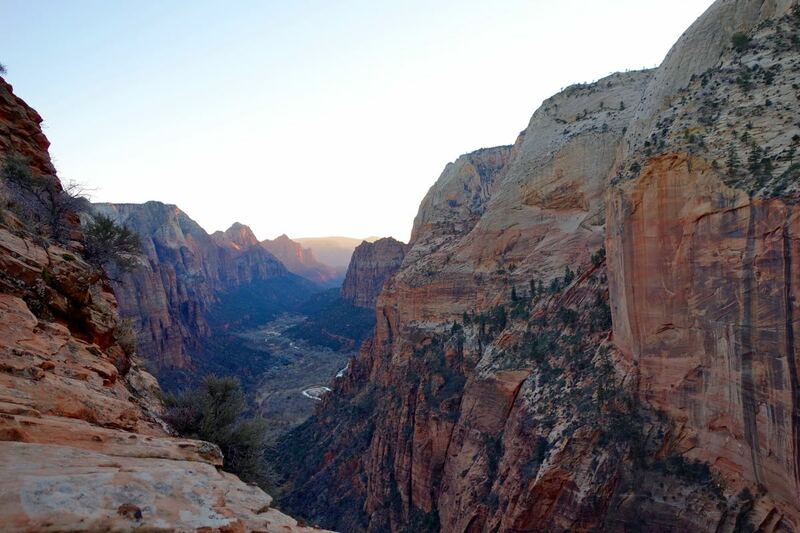 79% of women limit their trail running to daylight hours. Only 55% of men do the same. All demographics but age affected the way respondents answered this question. And some of the differences were equally radical to the above-described gender differences. For example, residents of different world regions differently approach trail running at night versus during the day. 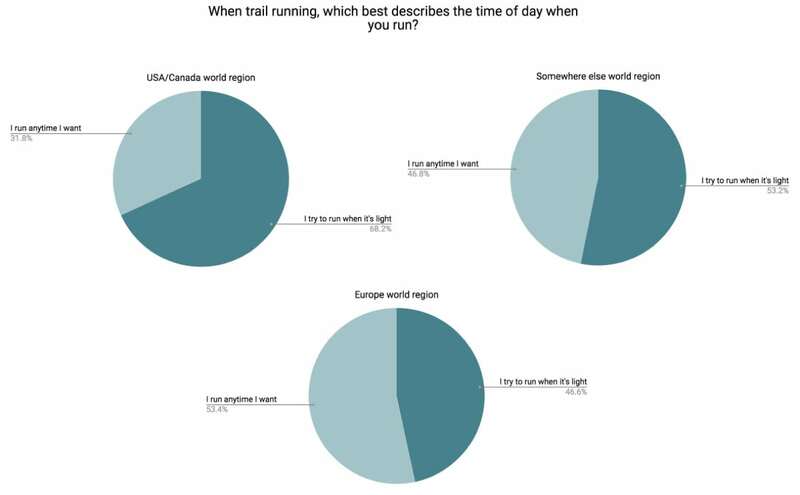 Some 53% of Europeans run any time of day, which adds up to 20% more than USA/Canada trail runners. See this data in chart form. 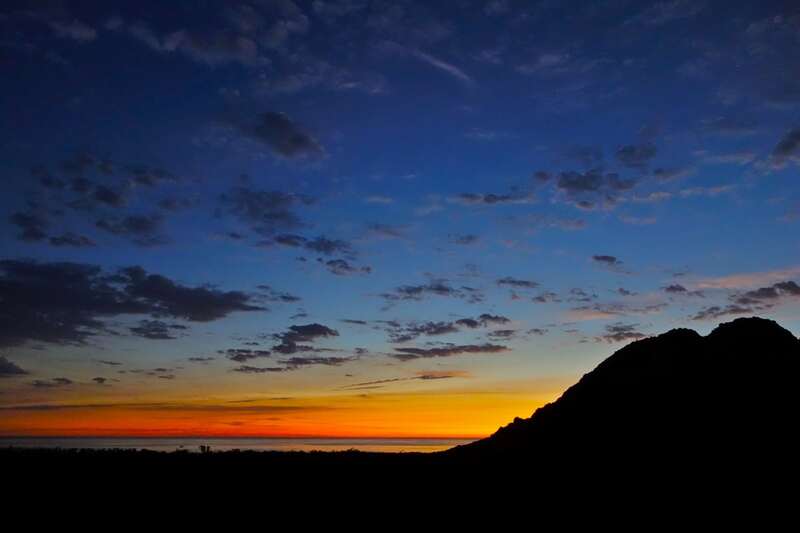 Now let’s zoom in on North American regions and their night-and-day trail runners’ play. Hey, U.S. Mountain region and Canada, here’s looking at you and how those who trail run in your region don’t mind the dark as much! See this data in chart form. You might predict that trail runners with a lot of years of experience trail running are more inclined to run at any time of the day–makes logical sense and the data agree with you. 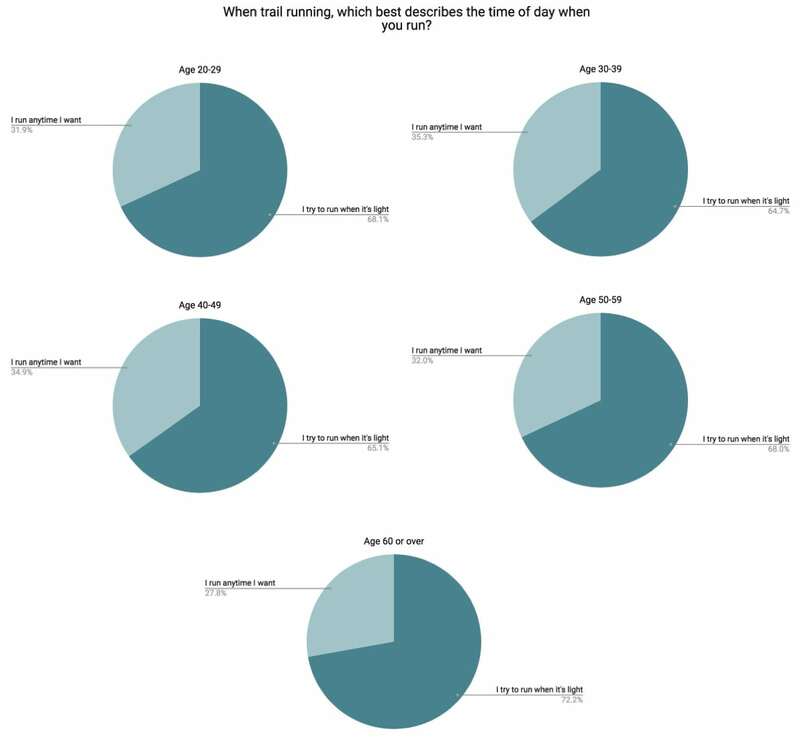 But what we found really interesting was that increasing a respondent’s age didn’t make them more likely to run at any time of day. In fact, the age 60 or over group was the least-likely-to-run-anytime-of-day group and the age 30 to 39 group was the most likely! We wonder, is this an expression of the schedule freedom that retirement can bring versus people in the height of their professional and personal lives? See this data in chart form. Question 5: Which of these [safety factors] do you think of when choosing a particular running route? Check all that apply. The biggest safety factor that trail runners consider before undertaking a run is the number of other people who usually use the route with more than a third of respondents considering this. See this data in chart form. Women were influenced by the number of people using the route, reports of harassment, the ability to flee or get help, and the availability of cell phone reception significantly more than men were. 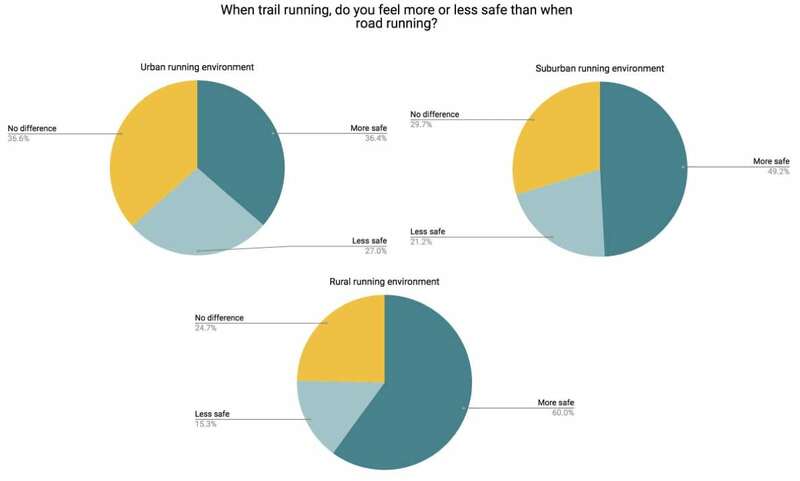 In fact, more than half of men said they considered “none of these” safety factors when planning a trail run, while only a quarter of women said the same. This gender difference held true on the roads as well. Female trail and road runners consider two of these safety factors far more often than males. But check out how trail running females and road running males consider reports of harassment on a route at just-about-equal levels! See this data in chart form. Once again, trail running experience was a moderating influence. The more years you run, the less you consider these precautions. See this data in chart form. Similarly, environment impacted responses. Rural/remote-environment runners considered these safety factors less than their city-and-suburb-dwelling counterparts. This makes decent sense as we recall that trail runners from rural/remote environments have significantly less concern about being assaulted and they think trail running is significantly more safe than road running. See this data in chart form. Question 7: Have you done any of the following [safety behaviors] specifically because of concerns about your safety due to humans while trail running? Check all that apply. Only about a third of trail runners reported they’d never changed their behavior due to concerns about other people. Running with a phone and telling someone where you’re running were the two behaviors trail runners adopted with the greatest frequency. See this data in chart form. Stark differences exist between women and men again. In fact, female trail runners do each of these behaviors at least twice as much as men do. And when it comes to running with other people for safety, women seek out partners four times as much as men. They also carry weapons or defensive spray almost four times as much as men. And they try to run during daylight hours almost four times as much as men. Perhaps most striking is the number of men who never take any of these safety precautions. A male trail runner is four times more likely than a woman to just head out the door without any of these safety precautions. The enormous gender discrepancy between safety behavior among trail runners reflects the discrepancy Runner’s World found among road runners. There are some notable differences we’d like to call your attention to, however. Curiously, both female and male road runners are slightly more likely to tell someone their running route than trail runners are. Both female and male road runners are more likely to change their route due to safety concerns than their trail running compatriots. Finally, we notice that female trail runners say they choose to run with other people for human-safety reasons with a frequency that sets them apart from both gender trends and their female road-running counterparts. See this data in chart form. Where in the world respondents live also affected how they answered this question. European trail runners indicate that they take the seven safety precautions offered by this question significantly less than residents of USA/Canada and other places in the world. See this data in chart form. Question 9: Have you ever cancelled a trail run specifically because of concerns about your safety due to humans? 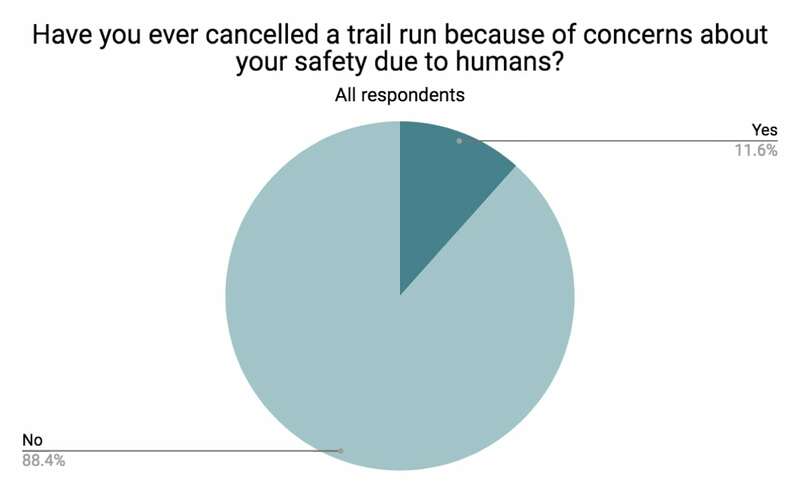 Phew, the vast majority of respondents said they had not canceled a run because of concerns over safety due to humans. See this data in chart form. Between men and women, female trail runners have cancelled a run due to human-safety concerns with nearly five times more frequency than men. Oof. Age is not a factor in whether a trail runner cancels a run due to safety concerns. Again, experience is. The more years trail running, the less likely a runner is to cancel a run. It’s fascinating that time on trails and not time on earth informs this answer. Also, given that this question asks runners if they’ve “ever” cancelled a run, those runners with a lot of years of experience have more time over which they could have done so, yet they reported cancelling with less frequency. See this data in chart form. 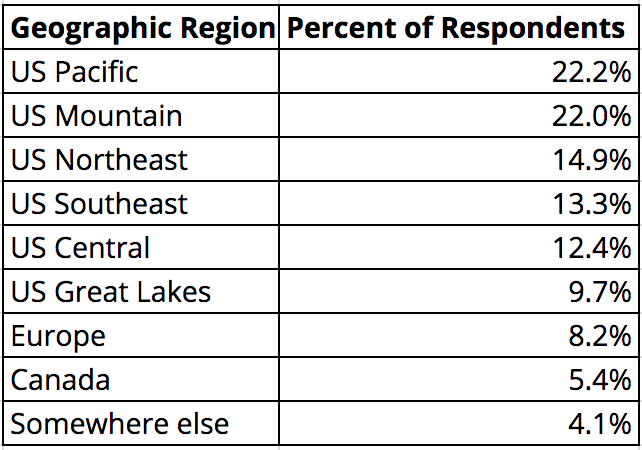 North American regions had a subtle but statistically viable effect on how respondents of those regions answered this question. It is the Canadians and those from the U.S. Mountain region who canceled their runs the least, and runners from the U.S. Northeast who canceled their runs the most. See this data in chart form. The survey asked 3 questions about experiences trail runners have with verbal harassment and inappropriate behavior. Question 2: Which of the following [inappropriate behaviors] have you experienced while trail running? Check all that apply. We are happy to report that the overall incidence of inappropriate behavior on the trails was low. 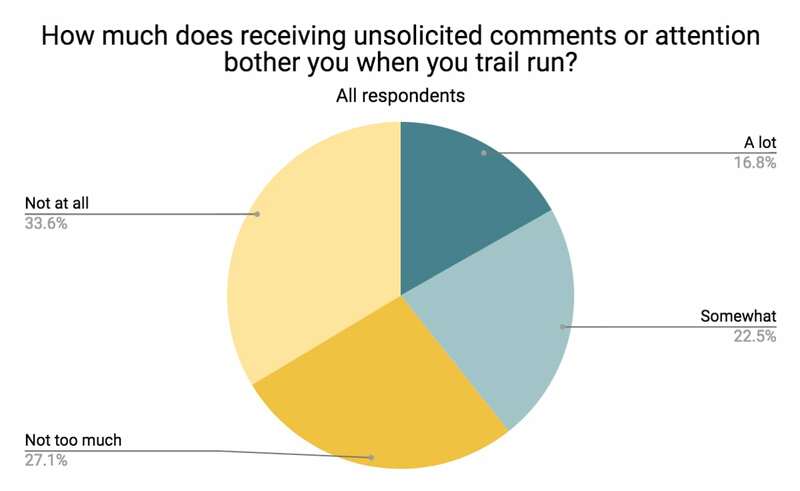 We are a bit less happy to report that the incidence of unsolicited-advice-giving was… not as low, with more than 4 out of every 10 respondents saying they had received it while trail running. See this data in chart form. At this point, you are probably not surprised to learn there are strong differences in the way that men and women answered this question, right? Here we go: females recorded higher incidences of inappropriate behavior than males carte blanche. Female trail runners were five times as likely to be sexually propositioned while trail running than males, and four times as likely to have someone follow them on a trail run than male runners. Yuck. The answers for which there were much smaller gaps in incidence between genders were unsolicited advice and lewd hand gestures. Turns out, people give both women and men plenty of unsolicited advice and it also turns out that men are also the unfortunate recipients of lewd hand gestures. Double yuck. Let’s compare the answers of trail runners and road runners. First, gender trends remain consistent between male and females both on the trail and road. Second, and notably, road running females experience these two forms of inappropriate behavior at a much greater frequency than trail females: they are followed twice as often and sexually propositioned three times as often. Finally, while road running men and trail running men report that they are sexually propositioned at nearly equal rates, road men report they are followed significantly more than trail men. See this data in chart form. Question 6: When trail running, how often do you get unsolicited whistles, cat calls, sexual remarks, or remarks about your body? Trail runners far and away report that these forms of verbal harassment happen “rarely” or “never.” Um, yay?! See this data in chart form. Not to beat a dead horse, but female trail runners have a different experience than their male counterparts. 16.1% of female trail runners reported being verbally harassed “sometimes,” “often,” or “most of the time” on runs. Compare this to 2.7% of men. Moreover, most male trail runners report they’ve never experienced verbal harassment, while less than half of female runners said the same. You betcha’, gender trends remain consistent between males and females on the road and trail. Given that road running females experience inappropriate behavior at a much greater frequency than trail running females, we should probably expect them to experience verbal harassment with greater frequency, too. Indeed, road females experience verbal harassment “sometimes,” “often,” or “most of the time” more than 2.5 times as often as trail females. See this data in chart form. Question 8: How much does receiving unsolicited comments or attention bother you when you trail run? 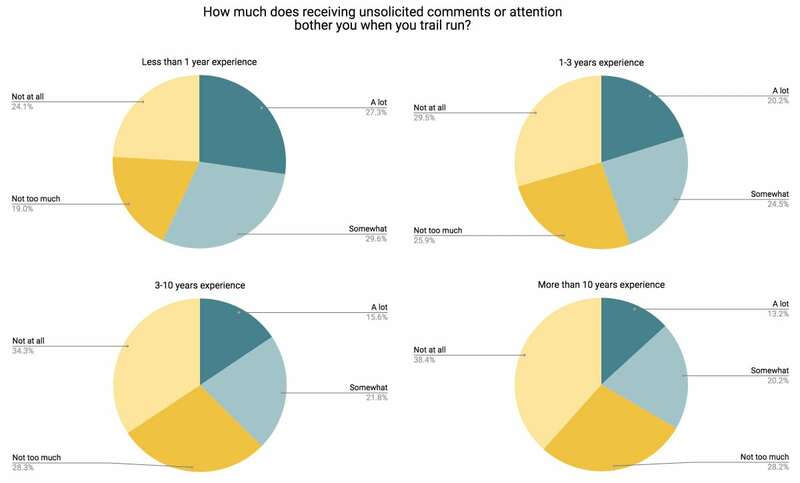 This is a sad fact: Almost 40% of respondents indicate that they are “somewhat” or “a lot” bothered by unsolicited comments or attention. See this data in chart form. Female trail runners are unquestionably more bothered by unsolicited comments and attention than male trail runners are. And also recall that 2.7% of men report experiencing verbal harassment “sometimes,” “often,” or “most of the time” on trail runs. Are trail running men underreporting inappropriate behavior and verbal harassment? Does being subjected to unsolicited comments or advice at significant frequency cause trail running men to feel bothered at a higher rate than would be expected for their overall reporting of small amounts of inappropriate behavior and verbal harassment? There is much to unpack here. It’s no surprise that gender trends remain consistent between males and females on the road and trail. But, wow, both female and male road runners are much more bothered by unsolicited comments and attention than their trail running counterparts. And if we were surprised by the degree to which trail running men feel bothered by unsolicited comments and attention based upon their very low reporting of inappropriate behavior and verbal harassment, then we should be knocked off our rockers by how bothered by unsolicited comments and attention road running men feel. 35% of road running men report feeling “somewhat” or “a lot” bothered by unsolicited comments or attention! 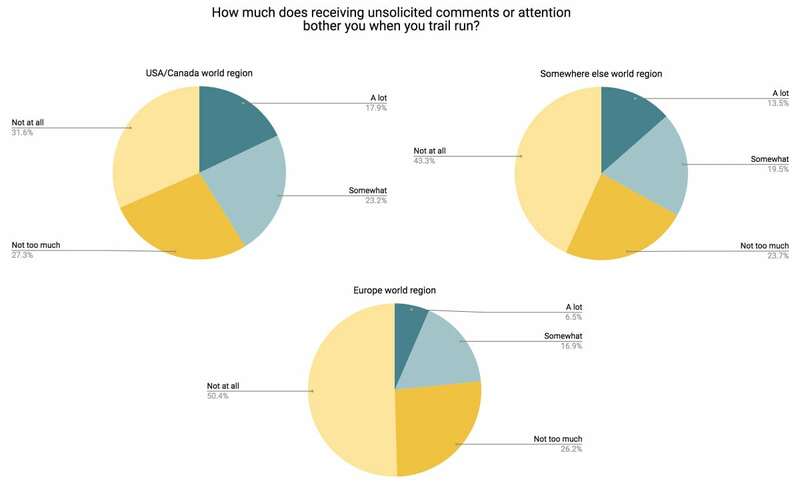 We are interested to see that European respondents report feeling bothered by unsolicited comments and attention the least, and USA/Canada respondents the most. See this data in chart form. 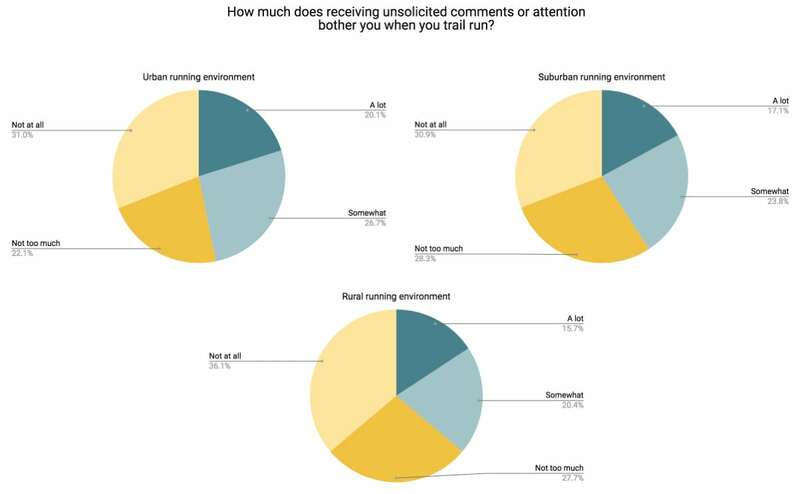 Trail runners in urban environments report feeling the most bothered by unsolicited comments and attention, and those in rural/remote environments report it the least. See this data in chart form. 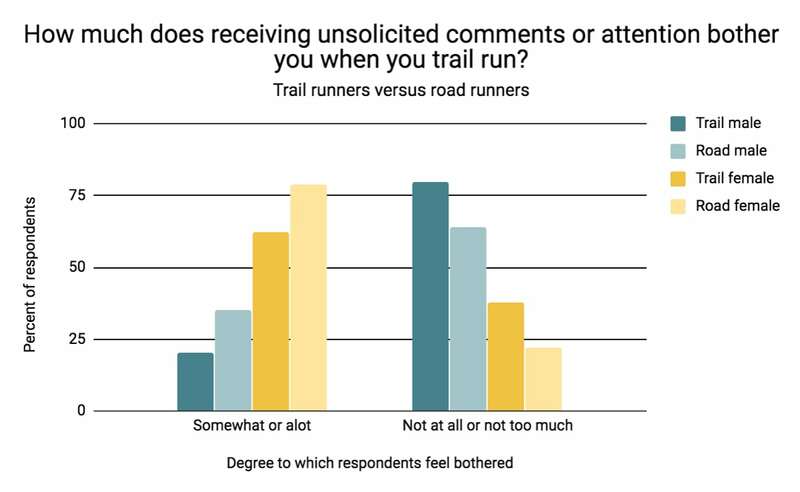 As both trail running experience and age increase, the degree to which respondents feel bothered by unsolicited comments and attention decreases. However, it’s the years-of-experience demographic where we see the most marked decrease. See this data in chart form. We set out on this survey adventure concerned about trail running safety and wondering whether this aspect of trail running might be significantly different for women and men. Do female trail runners have different experiences, concerns, and behaviors than men do? Our survey says yes. Oh, yes. Wow, yes. As a whole, we trail runners don’t experience much danger or harassment from other people when we’re out on the trails. And, by and large, the trail running world seems more hospitable than road running, as our levels of concern, reports of inappropriate behavior and verbal harassment, and general sentiment of feeling bothered by all that are lower than those of our road running partners afoot. It’s interesting to look at the variation in the way trail runners responded based upon where we live, the kind of environment we trail run in, our amount of trail running experience, and, at times, our age. But it’s the fact that women and men consistently have a different experience and different decision-making process when they head out the door that merits the most recognition. That is, analysis showed that the gender-based variations seen in the answers of all 10 safety-related questions are statistically significant. We want to be clear: a person’s gender affected the way they answered each and every one of the survey’s safety-related questions. No other demographic surveyed produced this strong of a response. We’d never thought about this difference before. Had you? More importantly, what do we do with this knowledge? What do we do knowing a good number of women are concerned about their safety and are more likely to be harassed or threatened? Should anyone be giving unsolicited advice to women or men out on the trail? 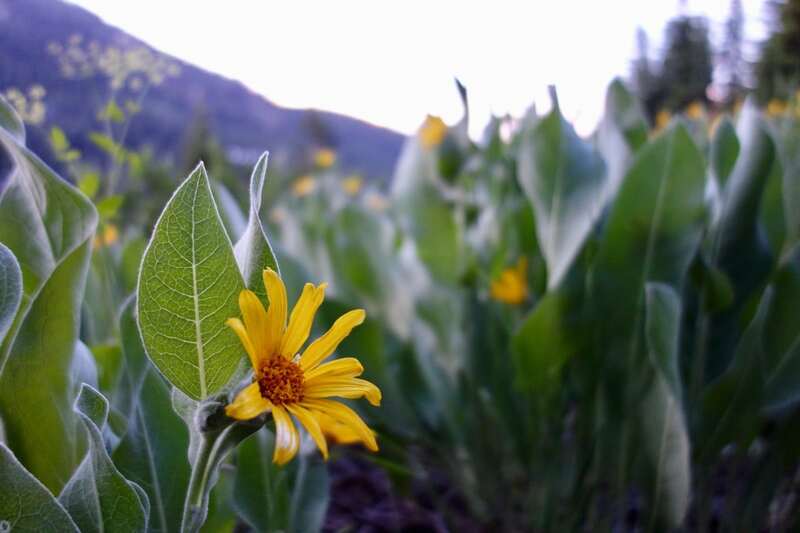 How do we make trail running not only be safer but feel better for everybody? Coming soon in another article, we’ll consider these questions and more. Please share your thoughts with us! When it comes to this kind of project, it takes a village, and we were fortunate to work with great people. Thanks to the present and past team at Runner’s World for their permission to model our survey after their “Running While Female” survey, including Melissa Stephenson, Michelle Hamilton, and Meghan Kita. We owe gratitude to Rachel Allison, Alicia Eno, and Donald Schoolmaster for sharing their expertise and advising in multiple aspects of social science. They helped us shape the survey questions, create the survey tool, and analyze and interpret data. Thank you to Sam Pilgrim who developed our results infographic. Thanks to Meghan Hicks for setting us on this path and providing great ideas and her own insight on the data. Thank you to Bryon Powell for his editor’s eye. We offered prizes that were raffled off at the end of the survey to its participants as incentive for completing the survey. We’ve conducted the raffle and contacted winners privately. Thanks for participating in the survey, and thanks to the brands who offered up raffle prizes, including Altra, Columbia Montrail, Hoka One One, inov-8, Jaybird, Julbo, Smartwool, Suunto, The North Face, Ultimate Direction, and UltrAspire! We recognize that this is a sensitive issue for many members of our community, and so we ask for civility in all comments. Of course, you are welcome to disagree, but we ask you to do so constructively. Thank you in advance for contributing to a healthy, helpful conversation. What observations can you add based on the survey results that aren’t discussed in this article? What are your thoughts on the results of the survey? Great survey! One question for the audience about #1: What is the best way to help other runners feel more safe? Not sure when approaching another runner on the trails whether to wave, head nod or otherwise acknowledge, or just mind my own business. It’s a good question, Brian. As a smaller female runner, I definitely don’t worry about how a cheerful, “Howdy!” will be interpreted. For my part, I feel a bit more on guard when I run by a male runner who does not make eye contact or acknowledge me. I’m curious what others think. I’d agree Liza, and I’m especially a little unnerved if I say hello to a male runner first and they do not respond. Wow – what an amazing survey and analysis – thanks to everyone who produced this! I tend to be friendly as well when passing others out running but we all have those runs where we’re tired or are just focused on our own efforts. These are not slights towards other runners and it would be a mistake that every lack of acknowledgement has anything to do with the other runner. I’m not sure that I would call it a mistake. Certainly not a slight toward the runner, but definitely something to log into the “things I notice” file. I obviously don’t face the same threat level that female runners deal with out on the road or trail, but I don’t think there’s such a thing as being too aware of your surroundings. I usually just leave it at a “Hey!” or “Good morning” unless they’re looking lost – then I’ll follow up with a “Do you know where you’re going?” – it’s surprising how many people will venture out on to the trails with only the vaguest idea of where they want to go. Thanks for asking this question, for a couple reasons. First, this is something that could definitely be addressed in more detail in our follow-up article with a number of people weighing in on their thoughts and feelings. Second, I really want to say thank you for taking the time to think about the perspective of the other people who are out on the trail. This is an awesome mindset for all of us to take out there with us, and I also think it represents your thoughtfulness and caring of the people around you. Thanks! Was the weapon-carrying purely an American thing? 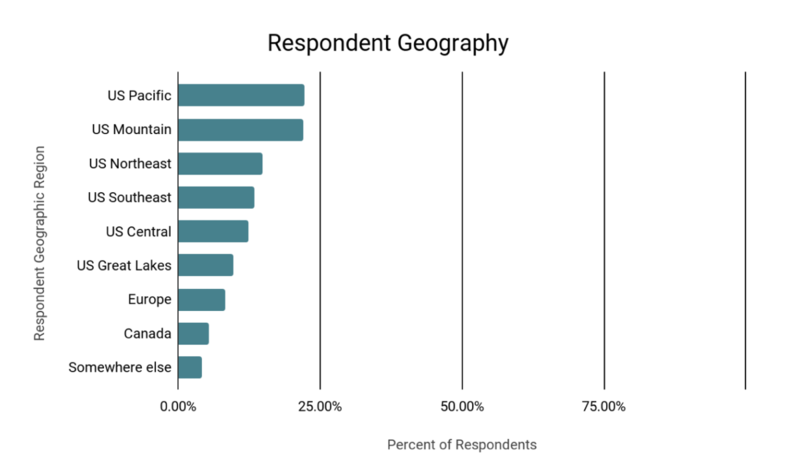 This graph shows the world-region breakdown you’re looking for, https://www.irunfar.com/wp-content/uploads/Question-7-world-region-1200px.jpg. The specific numbers are 20.1% of USA/Canadians, 3.0% of Europeans, and 8.3% of people who live somewhere else in the world say they carry a weapon or defensive spray to because of human-safety concerns while trail running. It doesn’t sound like it was asked for in the survey, but I’d be curious to see a breakdown of weapon vs defensive spray. My guess is that the vast majority of those responses are defensive spray, but if a significant amount of runners are out there frightened and armed with a weapon, maybe I should quit never being scared. I just wanted to leave a comment to confirm that, you’re right, we didn’t ask specific people what specific weapons/defensive sprays they carry. Future inquiries, perhaps, as I’m sure many would be curious to know what weapons people carry from among the self-defense choices like pointy-knuckles rings, knives, taser-type devices, guns, and more. Thanks for putting in so much effort to do this and raise awareness. (I love irunfar!) Quick question, and I apologize in advance if you addressed this but I missed it: Was the survey self-selected, in that people chose to participate? As opposed to randomly calling for participants? The latter would admittedly be very impractical–to “survey” a representative fraction of the trail running community. As I’m sure you considered, a self-selected study could theoretically be influenced by, for example, the idea that men and women that are inherently more concerned about safety from other humans might be more inclined to participate. Anyway, thanks again. This is a great lead-in to what I’m sure will be a important discussion. 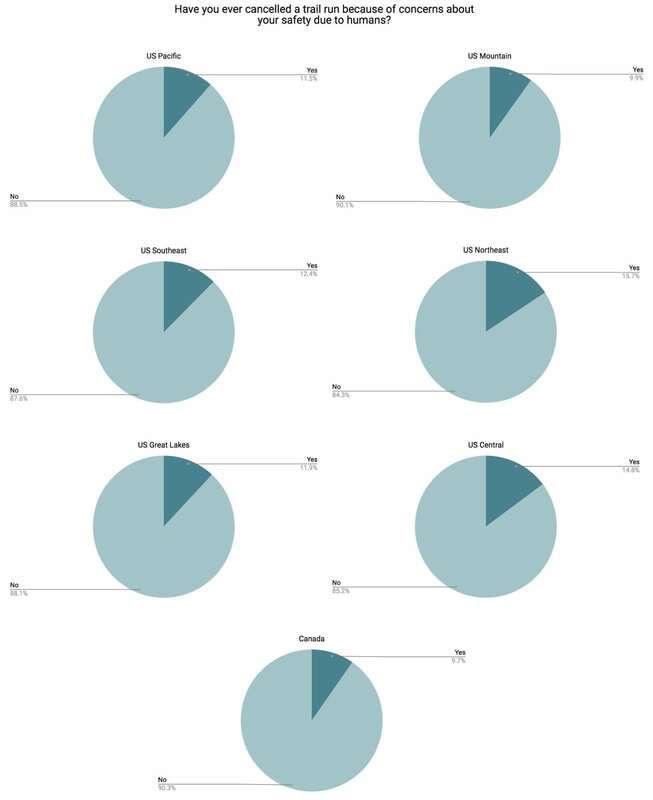 This was an internet survey where respondents self-selected their participation. The way we saw it going in was that biases could be introduced based on at least three circumstances: 1. the survey not reaching a representative population of trail runners because of its availability only on the internet for a discreet time period, 2. self-selection of people with more concern about safety/previous experiences with human hazards than the general trail runner population, and 3. self-selection of people with more dislike of a survey about human-safety issues/discussion about sensitive gender or other demographics differences than the general trail runner population. We attempted to counter potential biases in two ways: 1. calling it a trail-safety survey only in all of our messaging (as opposed to a human-safety trail running survey), and 2. asking a lot of entities in the trail world to help us publicize the survey, including people of multiple genders, age ranges, experience levels, friendship groups, world and regional geographies, media, athletes, community leaders, and more. Now that it’s done, do I think there are biases in our data? Yes. Biases are statistically probable in any survey. What biases do I think might be there? We didn’t reach as many international runners as we’d hoped, and I have to think that we didn’t reach as many of those urban trail/road crossover runners who we know exist out there. 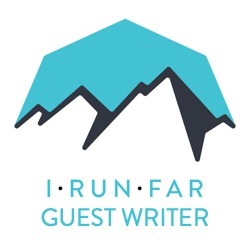 While the sample sizes of our various world geographies and urban runners were certainly big enough for analysis, they don’t match their representative size in the general trail runner population or iRunFar’s readership in the case of world geography. I am, however, pleased with our reach to trail runners of different ages as well as the male and female genders, as our various sample groups match pretty darn well the general trail running public as well as iRunFar’s readership. In the end, sample bias is always possible, and attempts to avoid it should be intentionally made. We did our very best to do so on the front end. There are no statistical corrections for possible sample bias. I hope that (over :-) ) answers your question and thanks for your enthusiasm. That’s perfect, thank you so much! Semi-joking question for the next survey – how many runners are afraid of being pepper-sprayed by (or attacked by a dog belonging to) another trail user? I had a woman pull out pepper spray and yell at me for following her on a trail I run 2-3 times per week. Luckily she didn’t spray it but I did have to turn around and basically go back 1 mile to take a different trail. I barely even noticed she was there prior to her yelling let alone was attempting to follow her. I understand these are important issues to discuss but some of these questions may lead to self perpetuating cycles. If I find out that everybody else is afraid of sharks when I swim in the ocean, I will be a little more worried about sharks regardless of the actual probability of being attacked by a shark. While people’s concerns and fears are interesting to consider for others’ perspective it should be noted the reality that violent crime, specifically stranger to stranger violent crime, is down massively over the last 10, 20, 30 years. I would like to see what this looks like compared to the trail running community. The dog question is certainly no joke. I have been attacked multiple times by another runners/hikers dog while running (I’m counting attacked as dog was aggressive enough for me to be afraid and it actually attempted to bit me). Worst incident was in the Columbia Gorge. I was running downhill on a section of quite narrow single track that was cut into and traversing a slope probably greater than 45 degrees over massive (1000+ cliff band) exposure. Hikers (male, female, and unleashed dog) were coming uphill. There was a good amount of visibility here and we could easy see each other for at least 50 yards prior to crossing paths. There hikers politely stepped uphill and off trail to allow me to pass. Dog lunges at me and attempts to bite – ripped several holes in my running shorts and scratched the underlying skin enough for be to bleed. Terrified, because I had to lunge to the downhill off the already narrow trail traversing the slope to avoid a worse injury, I managed to not fall (if I was not able to arrest a fall on the slope it would certainly lead to death if I went over the cliff band) and carry on my way. I did not stop to confront the party because a) the dog was clearly willing to attack me b) I was outnumbered c) neither individual looked particularly savory d) the guy was a big dude. It’s funny but also sad the the most terrifying experience I’ve had out in the woods was being attacked by an off-leash dog. I think this survey greatly missed the division between what actually constitutes a trail and a road in terms of hazards. The charts show that guys and gals fear about equally running into a wild animal, which are found on actual trails away from people. Half of all respondents live in urban areas and I guess consider city parks with populated unpaved paths as trails, to me this is still road running. This would lead to concluding that in populated areas women get harassed and assaulted much more often then men, a sadly true but well known conclusion. What is these days coined as a city trail is still subject to all the urban and suburban risks. In my opinion the takeaway message of this study is that in a pretty place just out of sight of the suburbs you are still more or less in the middle of town. In an area with actually remote trails where everyone is a hiker/runner I’ve seen many cans of bear spray, people are scared of bears, cats, and moose, and I’m yet to see someone offended by a “cute shorts” comment. First, no, half our respondents were not from urban areas. 12.5% of our respondents reported running mainly in urban areas, 38.7% in suburban, and 49.0% reported mainly running in rural/remote environments. However, no definitions of those environments were made, so respondents were left to define which one they thought they belonged to. -In Question 2’s answers, urban, suburban, and rural/remote runners reported they were followed and they received unsolicited advice at almost the same rates. -In Question 4, rural/remote runners reported they run at any time of the day more than runners in the other 2 environments. 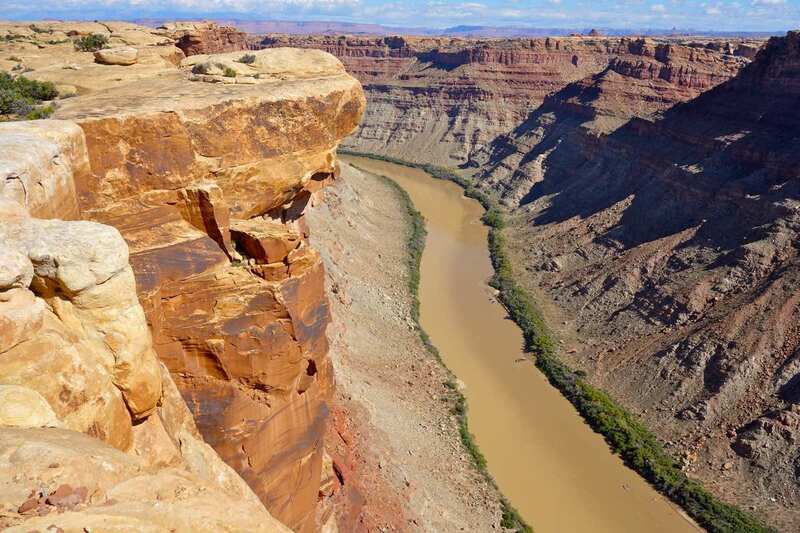 -Q5, rural/remote runners consider the offered safety factors less than runners of the other 2 environments. -Q7, rural/remote runners employ all but one of the listed safety behaviors significantly less than runners from the other 2 environments. Runners of all 3 environments carry a weapon/defensive spray at almost equal rates for safety from people. -Q9, rural/remote runners have canceled runs because of people the least among all 3 groups. -Q10 answers were a mixed bag. Rural/remote runners said they were “always” concerned about wild-animal attacks at a higher rate than the other 2 groups. All 3 groups said they were “sometimes” or “never” concerned at almost equal rates. In case you didn’t know, there’s a great body of research already out there and work still being done on understanding some of these same things in hiker and backpacker populations if you fancy Googling them up. I don’t believe there’s yet any research done on trail runners’ perceptions/experiences with human hazards in truly remote places, and I definitely agree with you that more research could be done to tease out more nuances (or a lack thereof perhaps, as we don’t know until we test :-) ). I appreciate your comment and interest in this project. Thanks for this survey and the detail with which it was carried out and written up. This is a sad and distressing phenomenon, but unfortunately not surprising overall. The first step is listening, and this survey helps. I look forward to future conversations about next steps. Sorry if I missed it, but did the survey ask who the runners were being harassed by? The Runners World survey seemed to lack this information as well. Are people being harassed by other trail runners, hikers, groups or single people, old or young? No, we didn’t ask. That would be very interesting to know. I have the impression that people have a lot of fear these days. Always concerned: 7.5% of the female, 4.5% of the men. That seems a lot for an almost non existing event. Trail runners should be more concerned about natural hazards like weather, water crossings and avalanches. There were two bear maulings within about a month several years back on a trail 2 miles from my house. Local runners have been killed by bears, as recently as last summer. Fatal cougar attack earlier this year in Washington state (MTB not running, but still); a black bear stalked and attacked a hiker in Canada in June; a woman was killed by an alligator in Florida in June; multiple animal attacks in just Yellowstone already this year; Jim Walmsley had an encounter with a mama bear and cubs during WS. Weather and water crossings are very easy risks to minimize (check out a map, look at the forecast, choose to not cross the river). Avalanche risk is different, however, you can always choose to not go onto the snow (yes, an avalanche can always be triggered on your from above but I think for the overwhelming majority of trail runners that risk is incredibly, incredibly small). What you can’t predict is if an animal is going to decide to attack you. Starving mountain lions, startled bear, aggressive deer/elk/moose. Even another runners or hikers dog. I’m impressed with quality of the survey. Unlike Max, I think it does do a better job than I expected of distinguishing between remote and suburban areas. None of the results are a surprise to me, but it’s good to have things quantified. 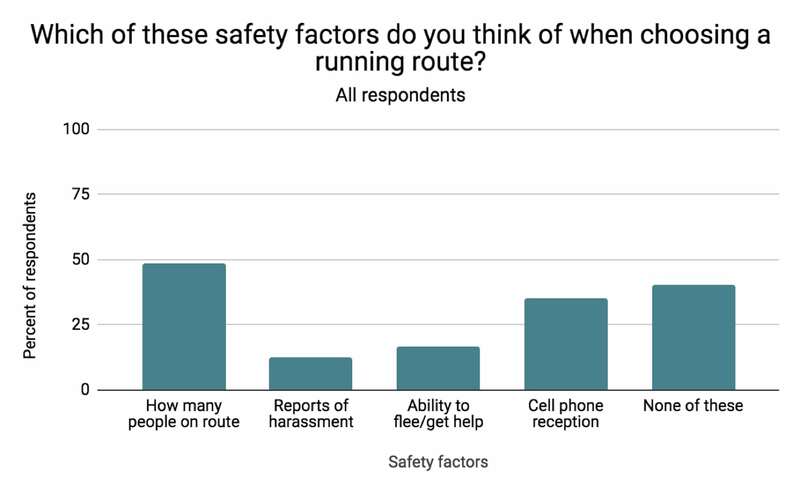 One important safety behavior that wasn’t included in the survey was running with a dog. My girlfriend runs with dogs for safety from both humans and wild animals. I run with a dog for safety from wild animals (realizing that not all dogs are trained well enough to do this). My dog chased off a half dozen bears last summer alone, preventing some too-close-for-comfort situations. Just last week, he chased off a large brown bear that I was less than 10 seconds from running right by – it was not visible, resting/feeding or whatever in a low spot immediately adjacent to my route. The unsolicited advice doesn’t separate the condescending type of advice and the unsolicited useful advice. Useful advice I received last week included, “There’s an angry moose up ahead, around the next corner”, or, “there’s a bear with cubs up ahead”. I can handle any situation, but having a heads up doesn’t hurt. 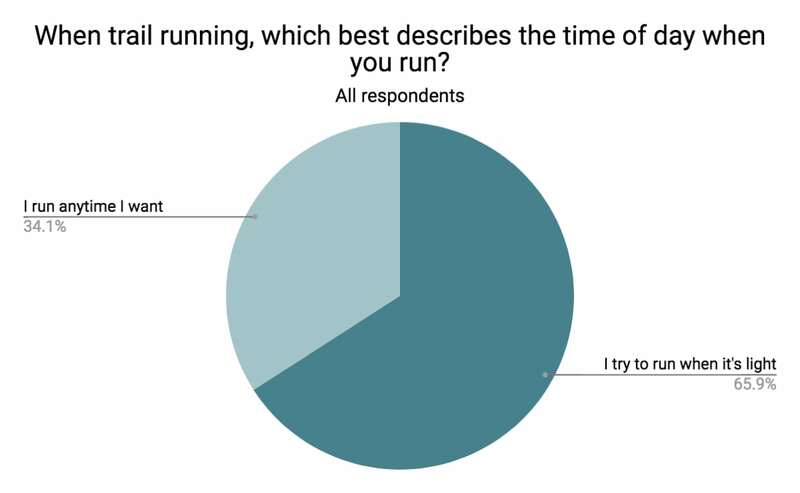 I like seeing the survey result that runners, especially women, like to carry their phones. I hope this encourages apparel and gear companies to make it easier. Very few shorts and tights have pockets big enough and secure/comfortable enough while running to carry a modern phone. I don’t like how phones have been getting bigger and bigger, but it’d be good if there were more options to carry them without a vest, belt, or jacket. Absolutely! Apparel and gear companies need to make larger and more pockets! Interesting survey! As a male I never consider humans, even though now that I think about it I was pushed and yelled at by a drunk frat boy type out with a group of his friends not too long ago while I was running. Things I worry about, in order: dogs off leash, rattlesnakes, mountain lions, bears. Seriously, dogs, everybody thinks theirs is special and different and the rules don’t apply. Maybe iRunFar could do an article about dog encounters and best practices from the trail runner’s perspective. It would be interesting to see an extension of the animal line of questions to see if people who worry about/alter behavior because of other people do the same for other dangers like animals, weather, dehydration, injury, etc that as far as I know are equally shared across demographics. This is a good suggestion. Some of these fears are generally baseless. How many people actually get attacked by mountain lions? How many runners encounter dogs that threaten (growl and/or bark at) them? How often? How many runners have been bit by a dog? Practically no one is attacked by mountain lions but millions of people are attacked by dogs every year. The fear or risk of being attacked by a dog is probably the most logical of all and yet it was left out of the survey. I don’t have any fear while I am running. But I have been bitten twice by dogs. What actually is the most annoying thing, are trail runners with dogs off leash where it is not allowed And usually it never is. They all think, it is so cool that their great puppy can run freely. But what actually is happening is that their dog is disturbing the wildlife. I’m confused by where y’all live that dogs have to be kept on leash. Not a single trail around these parts with leash laws. and as a matter of fact, I’m much more worried about being charged by an elk or meeting a bear than anything to do with dogs, seeing as I know plenty people who had to dive behind trees to evade elk. My experience is that in more suburban areas (like the trails in the extensive park system in the Berkeley/Oakland area where I often run) dogs on the trails are much more a problem than they are in more rural areas like the Tahoe area. My guess is that the more suburban dogs are not as well trained, not as used to being off leash in the wild, and are more likely to see runners as a threat that they need to attack or defend their owner against. The dogs in more rural/mountain areas are probably get out more, and are better trained to see runners as “friendlies” and wild animals as the threat to be defended against. In the end the problem is nearly always the owner and/or the dog’s lack of training, rather than the dog itself. – Yes, it is the owner’s fault. – But, please think about exactly what you were doing when it happened. I met a local walker/runner in the open space near my house who has been bitten multiple times. As I approached him with my dog, he made a weird move and quickly pulled his hands up by his head. It completely freaked out my leashed dog who then half-lunged at him, which I’d never seen him do in the past 5 years. Very odd. – Again, if you got bit it is still almost always the owner’s fault. But give your actions some thought. Thanks. Something to think about as a dog owner would be that once someone is bitten by a dog (on trail or off, on trail in my experience w/ a hospital visit to follow), it is much more difficult to blithely assume that unknown animals are harmless. If your dog had bit local walker / runner, it would have been your fault, or I suppose your dogs fault perhaps. It is disingenuous to both proclaim that it is the owner’s fault when this occurs, then imply that your dogs aggressive behavior is caused by another’s attempt to avoid coming to harm by encountering your animal. I completely agree with Seth on this. It is disingenuous to imply that it is the other guy’s fault that your dog lunged at him. Once you’ve been bitten and/or charged by an aggressive dog it is natural (and smart) to be on high alert when running by an unknown dog, especially one that is large or appears potentially dangerous in some other way. It is natural to want to keep your hands out of reach of the dog for instance. If your dog lunged at this guy, a) it’s your fault, not the other guy’s fault, unless he was directly threatening you or the dog, and b) it’s great that you keep your dog on a leash since you don’t really have full voice control and it needs to stay on a leash. Most people only think they have control of their dogs, very few actually do. On a given 1-2 hour run it is easy to common for me to come across 10-20 different dogs, many of them off-leash, and any of which might decide to run right in front of me, trip me up, jump on me, chase me, charge me or bite me. Not knowing any of them or their owners it can be quite difficult to determine which dogs are a threat and which are harmless. Sometimes all it takes is a sudden surprise encounter with a runner going fast on a downhill around a corner to trigger aggressive behavior in an otherwise harmless an friendly dog. I’m an experienced 6′ tall male trail runner and DOGS are the main hazard I worry about when trail running – I’ve never been harrassed or assaulted by a human on the trails but I have had multiple, very frightening encounters with dogs. I’ve been charged by very aggressive, threatening, off-leash dogs 3 times in the last 2 years on the trails in the east bay (SF area) park system, plus numerous incidents where dogs have chased me as I run by and/or try to jump on me, cut in front of me, etc. During all 3 of these incidents the owner was nearby and unable to assert any control over the dog. I started carrying pepper spray and/or a knife as a result of these incidents, although I have since gotten out of the habit. I have also modified my routes and habits so that I more often run on less populated trails and at times when there are less likely to be people walking dogs. A friend of mine who is a smaller male has also been bitten at least twice by dogs while trail running. I’ve seen a number of runners, both male and female, complaining about being chased or bitten by aggressive dogs on Strava as well. My guess is that dog on human assaults while trail running are more common than human on human assaults and wild animal on human assaults combined. Harrassment of female runners by humans may be overall a larger issue though. Cows on the trails are my other main concern, they rarely attack but they can be unpredictable and they often do not yield the trail. Stupid cows. Cougars are a distant 3rd, attacks are rare but they do happen and they are out there. I rarely run trails at night partially due to concern about cougars. Thanks for doing this survey, it is enlightening to see just how much more women have to deal with and worry about while running than men do. I do try to acknowledge almost everyone I see with a nod or wave or hello. On the men’s side the survey is missing battery/attempted murder on a run (as opposed to assault, which is the threat of such). It’s not a pretty thing to ask, but I’ve been through it and it’s f*cking hard thing to get back up from. I just wanted to say that I’m sorry that happened to you, and thank you for sharing the experience. How do these results on trail running differ from similar survey questions of road running? I know tons of women who won’t run alone, even in a safe area, for fear of being mugged. They carry pepper spray and other protection and always have their phone with them so they can call 911. As a female runner myself, I consider their behavior paranoid when many of the same women wear ear buds and can’t hear anybody come up behind them. They also believe all of the false reports on social media of people behind assaulted on local running trails. I would bet that a survey of people who run in urban areas would have an equally disproportionate percentage of women fearing human behavior as the trail runner survey found. As far as inappropriate comments, I say get a thicker skin. It happens and will continue to happen in spire of the #metoo movement – just ignore it. Thanks for reading and for your interest. When making a journey by public transport, how often are you concerned you could be assaulted or attacked by another person. My instinct is that it’s not so much the running – trail or other, that is responsible for the differences between male/female responses, but rather an individual’s perception of risk when out in public alone, which is almost certainly higher amongst females to begin with. Thanks for the comment, and, indeed, you are right. Much research has already been done on men’s and women’s perceptions of danger and actual danger in various public spaces, and there are distinct, gendered differences in both of these categories. You can pull up the results of these sorts of studies with a quick Google search. Hi Meghan, I’d be interested if their is statistical difference in “verbal harassment “ between front of pack, middle of pack and back of pack runners”? Really appreciate the important work irunfar is doing to explore this issue and make running safe and enjoyable for all. How is irunfar making running safer? We hope to make it a more inviting, friendly, and inviting place in the followup article. Something that would be quite in contrast to your regularly aggressive and negative appearances here on iRunFar. Not sure we can make it safer directly, but we can try to make it a better place and having something like this article, that can spark conversations and at least give a robust, if not academic set of data to show “look, this is real,” is a starting place. Brian, this was a serious question. Thanks for the comment. I’m afraid we didn’t collect any performance-type demographic info from our survey respondents that would allow us to examine this. I am with you, though, that this would be interesting to see. Yet another angle that could be taken in future research! :) Thanks for reading, commenting, and your support. The survey confirms that testosterone has been, is, and will be the primary source of issues out on the trail. Thank you, thank you, thank you for this survey! As a female trail runner, I appreciate not only the extensive data and results but also bringing to light the differences between the reality of female and male trail runners’ safety perceptions. Because I live in Alaska and have been charged, chased and followed by bears, I usually carry bear spray. Does this actually make me safer? I don’t know, though it does make me feel more secure and more willing to chose more remote and wild trails. I haven’t experienced much harassment on mountain trails but have had to shove pepper spray (though I didn’t actually spray them) into two men’s faces on two different occasions after being harassed and threatened while running on paved, urban trails.